Noah, written and directed by atheist Darren Aronofsky, is coming from a very good place. Aronofsky is Jewish, and his favorite Bible figure since he was little was Noah. He particularly set out to explore this momentous, but unplumbed Bible passage (Genesis 6:5-6) where God is sorry He made mankind (because of our wickedness) and decides to wipe mankind out. What is completely blowing my mind is that Aronofsky puts himself squarely in the place of a believer and enters so deeply into the psyche of Noah and those around him (as well as attempting to understand why a good Creator would “feel” this way, and come to this conclusion). Aronofsky lets God be God. God permeates the film. And He is not an ogre or a caricature. He is personal but ineffable. He is mercy and justice. “We are made in His image” is repeated over and over. I never really gave Noah much thought at all till now. Wow. Everything refers back to the Garden of Eden. Aronofsky is careful that we don’t start in the middle–he wants to hold the whole story together. Noah is the best Bible movie ever made. Yes, I just said that. It marries what was orthodox and more verbatim from the Scriptures in older films like The Ten Commandments with Charlton Heston and combines it with today’s sensibilities and film making genius (in all ways). But when I say “today’s sensibilities” I don’t mean politically correct and anachronistic. In Noah men are men, women are women, fertility is everything. Family is everything. Fidelity to God is everything. The tension between fatherlove and motherlove is palpable, and we see why we desperately need both to be in balance! The only thing that smacks of any kind of agenda might be the heavy stress on treating Creation well, especially animals (which I have absolutely no problem with and cheer heartily). The script even goes so far as to say (at one point) that the reason God is wiping out mankind is for the way we treated Creation. If this was all the script offered as explanation, I would have to give Noah big, big demerits. But in several other places, it tells/shows that we were corrupt in every way, in our dealings with each other (and treatment of women! ), killings, wars, etc. 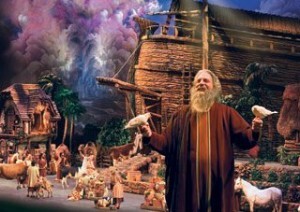 Noah is how you make a Bible movie. Noah is how you take the Word of God and seriously and humbly explore it in all its depth, complexity, nuance, raw human and divine drama without preconceived judgments on it, employing the best actors, composers, visual effects. This film breathes and sends you into deep contemplation/meditation. I didn’t think it was possible to do that with the Bible in film. What of the “poetic license” taken? Filmmakers had better take poetic license or they are not making films. Even if it is the Bible. Aronofsky uses “moral imagination” to the utmost. He is 95% faithful to the Bible in all that is essential — the heart of the story — and 5% is fanciful, but still informed by the text itself. For example, the most outrageous liberty taken is “The Watchers,” giant stone creatures way-too-similar to Transformers who try to help blundering mankind. But these creatures are inspired by the enigmatic Genesis 6:5-6. The editing is superb. The story never, ever lags. Nothing is drawn out, belabored and taxing as in most Bible and other epic films. I don’t want to spoil here, so I won’t, but Noah struggles with what God is asking of him, even in the clarity of it. Aronofsky imagines: what if Noah misunderstood a key piece of his mission–at first? The nature of good and evil is dissected at length. Tubalcain represents how evil reasons, an alternative way to see oneself “in the image of God.” Tubalcain believes that simply “taking” what one wants, harshly dominating the earth, and killing is what makes us like God. In contrast to Tubalcain, God’s providence explicitly overarches Noah and his family’s life. They trust in God, they wait on God. They imitate God’s compassion and gentleness. Noah shows how much is really up to us. We are to choose either darkness or light. We are to choose to love and obey God or not. There are real consequences, outcomes, repercussions and costs to our choices. Lectio divina, the centuries-old practice of prayerfully reading and contemplating a small portion of God’s Word alone or with others, can also be transferred to the screen as “cinema divina.” “Noah” is the ultimate example of “cinema divina” in my book. What I and many others in favor of this film did was a Judaeo-Christian read of “Noah.” And it almost totally works. I can explain away (by doing a Judaeo-Christian read) many elements that people say are Gnosticism or Kabbalah. However, some pieces definitely did not fit. Especially the snakeskin. In addition to my review, please also read this review by a theologian because I think what he’s saying is pretty undeniable. I disagree with Dr. Mattson when he says the writer/director is necessarily trying to dupe us, and I still think there is much good to be gained from doing a Judaeo-Christian viewing/contemplating/discussing of this film — a biblical film like no other, served up in a way that people will take seriously for its cinematic quality.